A BLOG ABOUT LIFE WITH KNITTING ON THE SIDE. 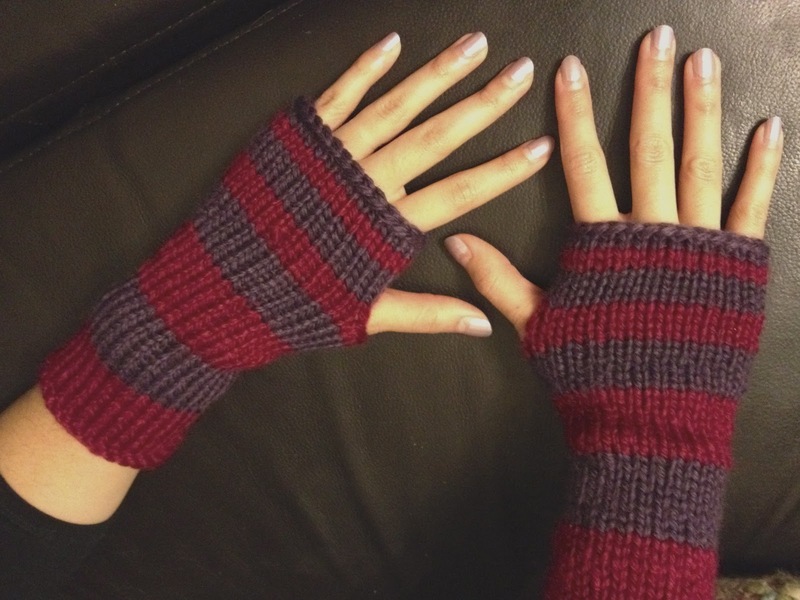 Here is another simple pattern for you...some fingerless gloves I made for my friend over at Loysh Photography. They are super easy and take no time at all to complete. 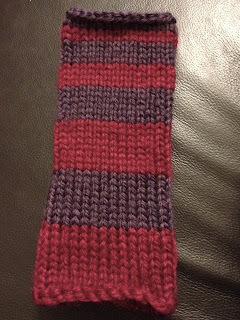 Yarn: Any 2 colours of yarn with a tension of 12st x 16rows (10x10cm). I used Lincraft's Veronica Yarn. Cast on 27 stitches (9 stitches per 3 needles) in colour A.
Knit 10 rows in colour A.
Knit 8 rows in colour B.
Knit 8 rows in colour A.
Knit 6 rows in colour B.
Knit 2 rows in colour A. 1. Knit until last 5 stitches. Cast off 4 sts, knit last stitch. 2. 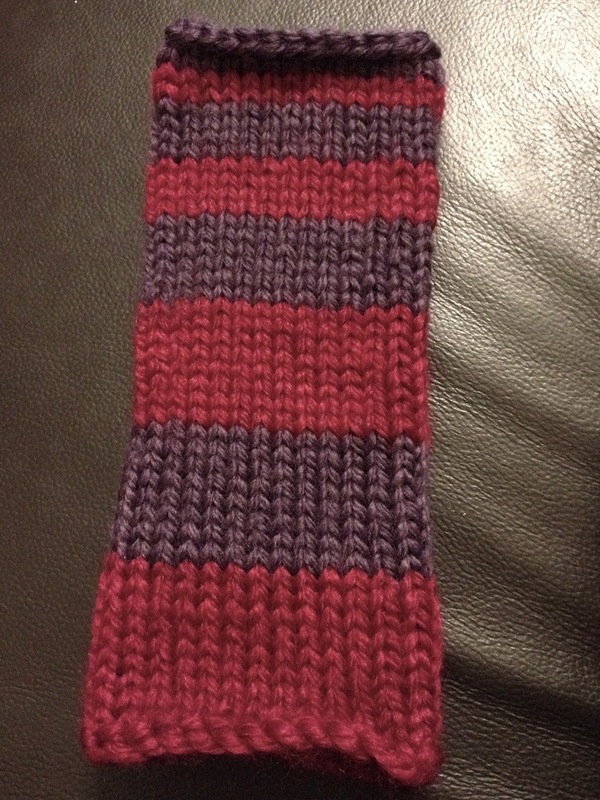 Knit until thumb hole, turn work around, cast on 4 stitches, turn work around again and knit last stitch. Knit 4 rows in colour B.
Knit 2 rows in colour B. Cast off in colour B, sew in ends. Your right handed fingerless glove is complete. For left handed glove, repeat pattern but for thumb hole, cast off 4 stitches from 2nd till 5th stitch of the row instead. If you need the thumbhole to be a bit bigger then simply cast off more than just 4 stitches. If you want the glove to come up higher on your arm then add more rows of knitting before you add your thumb hole. If you need the whole glove to be wider then add more stitches when casting on but you will have to measure your tension to figure out how many more stitches to add. Another important thing to note for this project is that when swapping colours, knit the first stitch of the new colour with BOTH colours. That way you will avoid creating a hole between each interchange. have u ever thought of being a hand model? sorry - not a knitting-related comment, but anyway.. WOOL & FLAX - Come check out our wonderful yarns and knitting accessories!